Radio buttons, or option buttons as Microsoft now refers to them, are used in online questionnaires, and forms that require users to make a selection. For the remainder of this tutorial, the term "option button" will be used instead of "radio button." 2. In the upper left corner, click the Microsoft Office Button. 4. In the Word Options dialog box that appears, select Popular. Note: Popular is the default selection. 5. Click the check box next to Show Developer tab in the Ribbon. Note: you want the check box enabled, i.e., with a check mark. The Developer tab now appears in the Microsoft Windows 2007 ribbon. 1. Click the Developer tab. 2. In the Controls group, click the Design Mode button. Note: you want the Design Mode button enabled. When it is enabled, it is highlighted in orange. 3. In the Controls group, click the Legacy Tools button. Tip: When you click the Legacy Tools button, if you have not already clicked the Design Mode button, the Design Mode button will now be enabled. 4. Under Active X Controls, click Option Button. 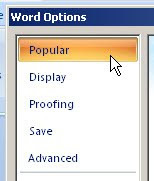 Result: An option button now appears in the MS Word document. 5. Hover your cursor inside the option button, right click, and point to OptionButton Object, and click Edit. Result: the colour of the option button changes, which indicates that you can now edit the text. 6. Use the left arrow backspace key on your keyboard to delete the default text, and change the text to suit your preference. Tip: if the text you want to add exceeds the default size of the option button text box, click on the black square on the right side of the box so that a double sided arrow appears, and drag to the right. 7. Click outside the option button. 8. Click the Design Mode button so that it is disabled. The radio button is now active—i.e., you can click it and a dark circle will appear inside, indicating that it is the option that you have selected. Add as many more option boxes as you like, and preface the series of options with a question, statement, or instructions. awesome yaar..u r just best..thanx a lot for helping in inserting the radio button. Thank u soooo much - spent so long trying to figure this out! Great easy to follow instructions. This was very useful! Good Job! How do you make it start a new series for each question? When I go to the second question for example it ties the radio buttons all together. This is SO not intuitive...and not on any Microsoft tutorial I could find - argh!! My form and I thank you!! Thanks! Quick question - does anyone know how to change font and font-size of the text/label? Excellent job done! This was very helpful and easy to follow..... Thanks once again. Question. I thought I had it, but I just discovered that checking one of the radio boxes unchecks ALL other radio boxes even in other rows. So how can I have more than one question using radio boxes... i.e., more than one set of radio boxes per page? Very well explained took me 30 seconds to get the radio button added to the word doc :) Brilliantly explained with images and instructions. Superb Job! When in DESIGN MODE, click on the PROPERTIES button. A window to the left will open. You will be able to see the properties for each OPTION BUTTON from the drop down menu. If you have added numerous buttons, they will all have their own spearate properties. Down the list in the window, you will see an empty field called GROUPNAME. Simply give the same title to each button that is dedicated to that particular question. Make sure the name is spelled the same (for the same question), and WORD will "group" them together. Test it out, by deactivating DESIGN MODE, and correct any possible problems by returning to DESIGN MODE and PROPERTIES. Thanks for the info on GROUPNAME. Works like a charm. Could not find it documented anywhere else. GroupName comment was also very helpful for me. Thanks for posting this info! Ok...I get the instructions on how to add a group name to all of the buttons....however I can still not select more than one button without the previous button becoming unchecked. What am I doing wrong????? Thanks!!! That is wondefully helpful . Easy to follow and is working! You should use a checkbox if you want to have more than one selection. A radio button only allows you one choice. I created a template (.dotm) file which can be used to create new documents based on the template. The template contains radio buttons. If, after saving the document as a .docx, I re-open it, the radio buttons are all duplicated. Anybody have any insight on this issue? When I get to step #4 I can not select anything-buttons seem to be inactive....? How can I activate? Thanks so much, I have been trying to figure out how you enable the control button and nobody else on the net was giving instructions that answered my question and then finally, I was led here and my question has been finally answered and I am thrilled to pieces. "When I get to step #4 I can not select anything-buttons seem to be inactive....? How can I activate?" When in design mode, right click on the radio button and click on properties. This will open a window (controls) on the screen. You'll have to make sure the value to "Locked" is set to False. If it is set to true, you would not be able to select that option. PS: Kudos to the thread starter as it has helped me like many others in million ways. Cheers! Can the radio button be changed to look like a check box? If so, how do you do that? Life Saver!!!! Easy to follow instructions, you ROCK! I got buttons added and did the groupname thing. Now how do I clear the selections? There is probably an easier way, but while in disign mode if you click on the option then click properties, you find the third to the bottom says value it will be true. Change it to false. I have 25 questions with 6 buttons each... that's a lot of properties/grouping one by one. Is there any way to name each group, by selecting the group? Or is there any way to set the macro to make it start a new group somehow? Thanks a lot,Really more helpful. multiple radio can be easily added by doing same..
You are great, this was really easy to follow! Hey I have the radiobuttons have a default value of 'true'.. Thus i cant make them mutually exclusive..any help? Is there a way to have them use a default value of 'false'..?.. i tried changing the properties but to no avail.. Thank you for the info above, it was all very helpful. One question, when I print the document, the radio buttons print with a box around them. Is there any way to eliminate the box so it just looks like the button? I'm having this problem too but I didn't see the answer: How do you make it start a new series for each question? When I go to the second question for example it ties the radio buttons all together. thanx a lot it is a really helpful post. how do i fill in colours in the option next to the radio box? These instructions are spot on! Got it right the first time. Thank you so much. Amazing tutorial... Thanks so much for the clear instructions! Thank you very much. Problem solve. Unfortunately, I have a question about Word forms as well. I would like to add 'print' and 'clear form' buttons to my Word 2007 forms. I've spent the better part of an entire day and a half looking for information on this. All I've found is to unprotect the document first which defeats the purpose and is not an option for our clients to have to do. Seriously, these are 2 of the most common features on a form. Any suggestions? ps. if I had my druthers, these would be pdfs. thanks much for any assistance. Thanks a lot.. was of a great help! Very clear step-by-step guide. Thumbs up! I have created a form, it has two section I have two questions. 1. In the first section I have 5 radio buttons. How can I set the first option button as a default? 2. In the first section, if the last option button is selected, how can I set the option buttons in the second section only be used when that option button is selected? I do not get a "Design Mode" button in the Controls group. Any suggestions?